Since the launch of PARS we have received thousands upon thousands of voucher photos, many of which are outstanding examples of wildlife photography. Among these, certain photos always stand out; either for outstanding clarity, composition, behavior of the subject, or other possible reasons. We would like to start showcasing the quality of our best photographers with an annual photography contest. Entrants in of the categories listed below will compete for 1st, 2nd and 3rd place awards, and winning photographs will appear in the last newsletter issue of each year until 2022. First place winners may see their winning photographs in, or on the cover of a future PARS newsletter, or possibly in the final publication for the PARS project. One photograph will be chosen as the ‘Best of Show’ grand prize winner each year. Photographs will be judged on composition, creativity and clarity of the shot. Species Representation – These photos should be approached as though they are going to be used as a field guide representation of the subject. Adult, juvenile, larval and egg stages are all acceptable, but only two photos of each species may be submitted. Behavior – Action photos showing a specimen (or specimens) engaged in a natural activity such as feeding, courtship, etc. Macro Photography – Close-up photos of any portion of an amphibian or reptile. There will be a first, second and third place winner for each category, with the exception of the Species Representation photos, for which there will only be one winning photograph for each species judged. Deadline for photo submission in this year’s contest is September 31, 2018. Winners will be announced in the Winter 2018 newsletter. 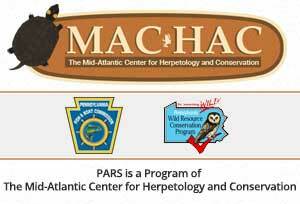 Registered PARS participants only, including all volunteers, coordinators, land-owners, MACHAC & PFBC personnel. Participants will retain ownership of their photographs, but by submitting agree to allow MACHAC to use the photographs in any of its future publications. Two photographs for each Pennsylvania species may be submitted in the Species Representation category, and one photograph may be submitted for each of the other categories. Photos will first be screened by MACHAC personnel to ensure criteria have been met, and then presented anonymously to a panel of judges without photographer information. These judges will select the winning photo for each category. Judges may enter the contest but will not be permitted to judge their own photos.